Evancliffe Leathercraft was set up and is run by Clive & Wendy Elsdon. We first developed an interest in leatherwork as an offshoot of Green Woodworking. The first leatherwork we undertook was the design and manufacture of leather tool guards and cases for many varied green woodworking tools, such as draw knives, spoke shaves, froes, carving knives etc. This lead to an interest in leatherwork in general and then enrolment on the first QCF Level 2 Creative Craft Leathercraft course at Northumberland College’s Hexham Centre. We both successfully completed the course. Our diverse range of hand crafted leatherwork includes Belts, Bags, Purses, Leather Hand Bound Journals and much much more. Many of the items have developed from a customer saying, “Can you…” and us saying “Yes!” Training We offer a wide range of Leatherwork Training Workshops to suite everyone. For example students can learn to make a Leather Belt, a Hand Bound Leather Journal, a Tool Cover or a Water Bottle amongst other things. As a part of the learning process the student will often come away with an additional small leather item as well. We are constantly developing new workshops. We are also available to demonstrate Leatherwork as well as other traditional crafts like Green Woodworking & Willow Weaving at events including running hands-on activities such as leather stamping and stitching. We are fully insured and have the Craft Courses Gold Students Choice Award. Hand crafted, hand stitched leatherwork. Bespoke items. 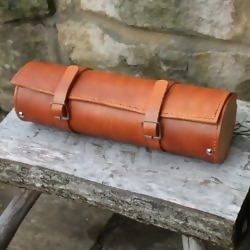 Railway Leatherwork. Leather Tuition & Activities.